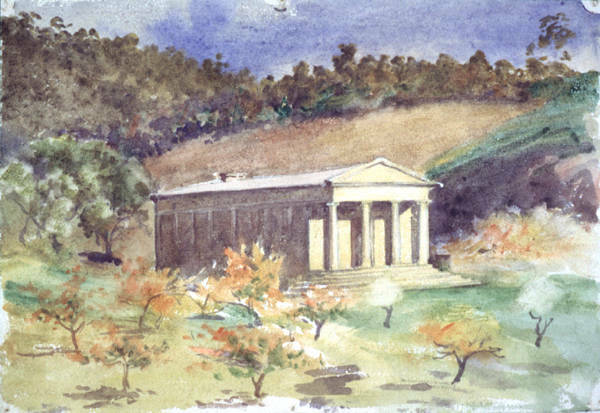 The Lady Franklin Museum is a classical temple built by Lady Franklin in 1842, and named Ancanthe, 'blooming valley'. Wife of Lt-Governor Franklin, Lady Franklin was shocked at Tasmani's lack of cultural institutions, and colonists' indifference. She built the temple as a museum, and left 400 acres in trust to ensure the continuance of what she hoped would become the focus of the colony's cultural aspirations. A century of apathy and forsaken duty by the administrators of the Anglican Church and the city of Hobart followed, with the museum used as an apple shed among other functions; but in 1949 it was made the home of the Art Society of Tasmania, who rescued the building. In its arcadian setting at Lenah Valley, it sits like a 'tiny Temple of Athene ' – at once ineffable and enchanting. Further reading: M Germaine, Artists and galleries of Australia, Sydney, 1990; W Hudspeth, Souvenir, Lady Franklin museum, Hobart, 1949.